The AHP Aloe (Aloe vera) monograph establishes standards for ensuring authenticity, purity, and quality control, and represents one of the most comprehensive standards for aloe vera leaf juice and inner leaf juice GMP compliance in the English language. The monograph is primarily used for compliance with standards established by the International Aloe Science Council (IASC), which establishes limits on the levels of anthraquinones contained in finished products. Aloe Vera Leaf Juice and Aloe Vera Inner Leaf Juice are the first monographs of this kind on the juices. The phenolics-rich aloe latex (exudate), sometimes also referred to as “juice,” is one of the oldest and widespread botanical drugs in the world. However, less attention has been given to the filtered leaf juice (also known as whole leaf extract) and inner leaf juice (sometimes referred to as “gel”), which have become popular commercial botanical materials in the past 20 years, and from which the potentially toxic anthraquinones have been removed. Concerns regarding the potential carcinogenicity of aloe vera anthraquinones were raised in a National Toxicology Program (NTP) study in which large quantities of high-aloin-yielding products were administered to animals. Some of these products averaged 6300 ppm of aloin A, in contrast with many of the aloe vera juice products on the market, which limit aloin to less than 5 ppm. Additionally, these preparations were administered every day for two years, a dosage regimen that is inconsistent with common usage. The AHP monograph is the first pharmacopoeial standard developed for aloe vera leaf and inner leaf juice. These are important herbal products worldwide and must be distinguished from the high-aloin-containing and filtered juice products that are in compliance with IASC guidelines. 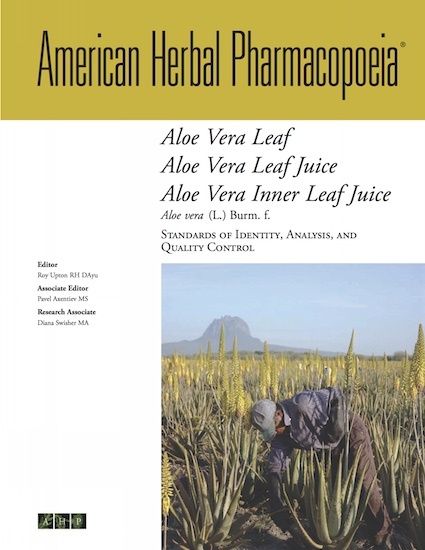 Unlike other AHP monographs, the aloe vera monograph lacks the Therapeutic Compendium that typically accompanies AHP’s Standards of Identity, Analysis, and Quality Control.